In the last few decades, and especially from the late 1970s with the rise of Thatcherism and Reaganism, the business world has been under the spell of neo-liberalism, obsessed with economic reform, growth, an ever-expanding free-market liberalism, structural adjustment policies, privatisation, deregulation, profit maximisation, cost minimisation and the highest bonuses for short-termism, amongst others. These have led to the business community to believe-by and large- that there is competition between being efficient and profitable, and being for the common good. Yesterday (8 June 2014) my wife and I were driving along the beautiful Oxfordshire country roads on our way to Waterperry House, while listening to BBC Radio 2 ‘Good Morning Sunday’ with Clare Balding. Every Sunday Clare talks to guests about their life and beliefs exploring, through conversation, matters of faith and spirituality. And then, Clare mentioned that she was about to interview a very spiritual and successful businessman, called Randy Lewis, a businessman who was inspired by his son Austin - who has autism - to create a workplace where people with disabilities don't just succeed, but thrive. 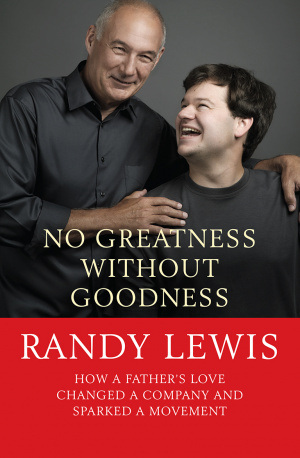 Randy's book, "No Greatness Without Goodness" tells the story of his campaign and how he rolled out the initiative, not just in the US Walgreen retail stores, but worldwide. Randy is the former Vice President of Walgreens, Peace Corps volunteer, Fortune 50 executive and accidental advocate, led Walgreens' logistics division for sixteen years as the chain grew from 1,500 to 8,000 stores. He introduced an inclusive model in Walgreens distribution centres that resulted in ten percent of its workforce consisting of people with disabilities who are held to the same standards as those without disabilities. Its success has changed the lives of thousands with and without disabilities. I salute you Randy Lewis for proving the neo-liberals wrong: Yes, business can be efficient and profitable. But, at the same time and simultaneously, it can be kind, generous, sympathetic and caring. In all, business can be for the common good. And now my friends, readers of this Blog, I very strongly encourage you to listen to the interview, believe me you will be much happier for it.